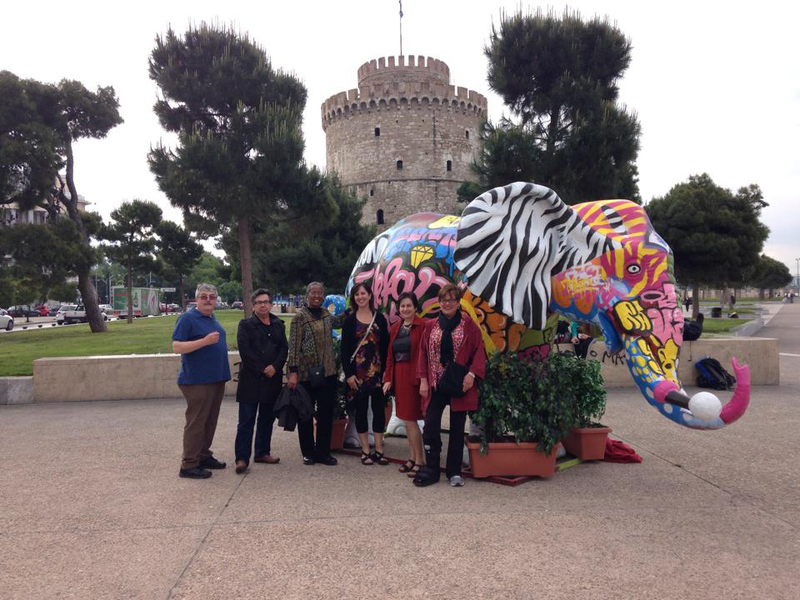 Alabama Greece Initiative participants in Thessaloniki. Ever wanted to eat lunch at the foot of the Acropolis in Athens, Greece? Or study ancient Greek literature beneath a statue of Alexander the Great? Each year, UA faculty and students are invited to apply for the Alabama Greece Initiative, which allows them to travel to Greece in order to study and conduct research on topics of their choice. On Oct. 22, a group of UA professors who participated in the Alabama Greece Initiative this year held a symposium to discuss their findings and experiences. Though students had visited Greece for academic purposes before the initiative was created in 2010, its founding offered full research and academic opportunities for UA and its partner school, the University of Aristotle in Thessaloniki. The attending professors conducted research in numerous areas of study. Theatre and Dance Associate Professor Andy Fitch, for example, attended the trip to study European stage design and how it differs from the “realist monopoly” that grew in American theatre in the early 20th century. He took over 2,000 photos of architecture, museums, and landmarks while on the trip to inspire future scene design at UA. He also drew inspiration from visits to Byzantine cathedrals and the Parthenon. The UA Department of Biological Sciences was represented by Dr. Juan Lopez-Bautista, who worked with Aristotle professors on research in systemics, biodiversity, and phylogeny, particularly in the study of algae. Given that Thessaloniki and Tuscaloosa are both near a water source, this partnership allowed them to compare the biodiversity of algae in both regions- near a lake and near the ocean. They also studied toxic algae. “Many of us don’t know we are wearing, using, or eating algae all the time, but they provide most oxygen for life on our planet, and affect the quality of our air and water,” Lopez-Bautista said. Andrea Cevasco-Trotter, a professor of music therapy, hopes the partnership with Aristotle will strengthen both school’s musical therapy departments, given that Thessaloniki has no medical music therapy, and Tuscaloosa is the site of the only music therapy school in Alabama. “Our state is not as progressive as music therapists in Georgia. Many of our students leave the state for their 6-month internships and never return,” Cevasco-Trotter said. To extend his summer GEO421 course from Turkey into Ephesus, Greece, Dr. Ibrahim Cemen of Geology took his students all over the Aegan Sea, meeting up in Thessaloniki in hopes of studying the region’s earthquake history- particularly comparing the 1999 earthquakes in Athens and Istanbul. Dr. Tatiana Tsakiropoulou-Summers, a professor of modern languages, attended the trip to work on her new book, Women and the Birth of Democracy, seeking to prove her hypothesis that the invention of democracy in the 5th century devalued women in the cultural sphere and affected their portrayal in Western culture. Many of these research opportunities afford professors the opportunity to teach new classes, and expand their research proposals into other areas, giving students experience for graduate school. Both Cevasco-Trotter and Tsakiropoulou-Summers, for example, will be cohosting conferences with Aristotle faculty in 2016 to present their research findings. The College of Arts and Sciences is now accepting research proposals for the 2015 Alabama Greece Initiative. For more information, visit http://greece.as.ua.edu/.